& the "Tunnel of Light"
Many people reporting their deathbed experiences say 'Ah, it's "getting darker"'. Yet other people reporting near death experiences say they "entered darkness into a tunnel through which they passed to enter into the light". And others describe passing through a "tunnel of light". These are also descriptions of strange and wondous aspects of these individually profound experiences reported by these people. The fact that observers never see this darkness, these tunnels, this light, or tunnel of light, does not mean they are any less real experiences - people reporting these experiences really do undergo them. Now if they are not spiritual experiences, then how can the body generate such experiences of light, of darkness, tunnels, and of a tunnel of light? This web page describes how the body is capable of generating such experiences, and supplements an article I wrote on this subject for the Skeptical Inquirer in the beginning of 2004. Light Experiences - "Seeing the Light"
Many people reporting near-death experiences tell of seeing a wonderful "bright light that does not hurt the eyes", "wonderful brightness". They may pass through darkness to "enter the light", or they pass through tunnels to enter the light. These are all part of the near death experiences undergone by some people. 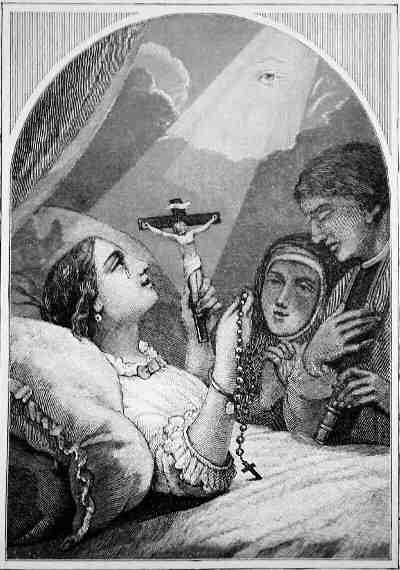 To the left is an old engraving illustrating a deathbed light experience. An unfortunate young woman receives the solace offered by her religion during her last moments. And during these last conscious moments, she perceives herself to be illuminated by a heavenly light, as well as the all-seeing eye of her God, and realises she will go to the paradise promised to all believers. The watching priest and nun quite evidently do not see this light, just the expression of joy on the dying woman's face. This is true of all deathbed experiences. Dying people say to others clustered around their beds that they can see a "wonderful bright light that does not hurt their eyes", but no-one else other than the dying people can see this light. The same is also true of those observing people who later report having undergone near death experiences at the same time as observers were watching them. The observers never report seeing the light, or the other experiences undergone by those who underwent these near death experiences. Such experiences of light and passages through tunnels are profoundly moving experiences to those who undergo them. Even so, these experiences are explained by the functioning of the body during these experiences. As a practical physician, my initial approach is always anatomical - first see what apparatus is available to perceive light. Light which everyone sees with their eyes as well as photgraph is electromagnetic radiation in the wavelength range 400 to 700 nanometers (one nanometer is 0.000,000,001 meter). The sequence, or rather the chain of perception and seeing light is as follows. Light enters the eye through the pupil (number 1 on the drawing). In the back of the eye, the light impinges on the retina, a light sensitive membrane at the back of the eye which converts the images into nervous signals (number 2 on the drawing). Nerve signals generated by the retina are conducted along the optic nerve into the skull (number 3 on the drawing). Inside the skull, the optic nerves enter into the "lateral geniculate bodies� on the upper brainstem, which are relay stations for nerve signal inputs from the eyes. The lateral geniculate bodies filter a lot of noise out of the nerve signals in the optic nerves, and then transmit these filtered nerve signals further into the brain (number 4 on the drawing). 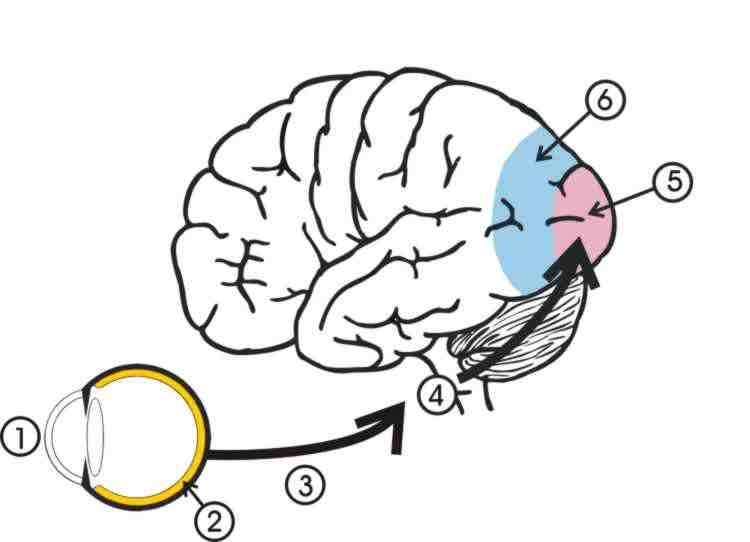 The filtered nerve signals enter the "primary optical cortex", otherwise also known as the "visual cortex", which performs some primary processing of the filtered nerve signals (number 5 on the drawing). After undergoing processing in the primary optical cortex, the nerve signals are transmitted to the "associative optical cortex" where these signals are interpreted (number 6 on the drawing). Finally, the conscious person perceives images of what they are looking at. Failure of any link in this chain of perception means affected persons are blind and will see nothing, no light, only darkness. Furthermore this chain of perception reveals how it is possible for the body to generate light and tunnel experiences, so that people can perceive bright light, or experience darkness, or pass through a tunnel to enter a region of bright light, while observers notice none of these things. The pupils regulate the amount of light entering the eyes by narrowing to admit less light, and by widening to admit more light. Pupil diameter in the normal human eye can vary from as little as 1 millimeter to as much as 10 millimeters. The area of the pupil through which light can enter the eye is a circle, which means that when ambient light levels remain constant, the pupil can admit as much as 100 times more light when widening from 1 to 10 millimeters in diameter (see drawing below). So a person whose pupils widen significantly will notice that their surroundings become lighter, while those in the vicinity of that person, and whose pupils do not widen will notice nothing. And when that person says, "Everyhting is getting brighter and brighter", or "I can see a bright light that doesn't hurt my eyes!" - these other people will say that the person who sees the bright light is hallucinating, even though that person really does see a bright light that does not hurt their eyes. 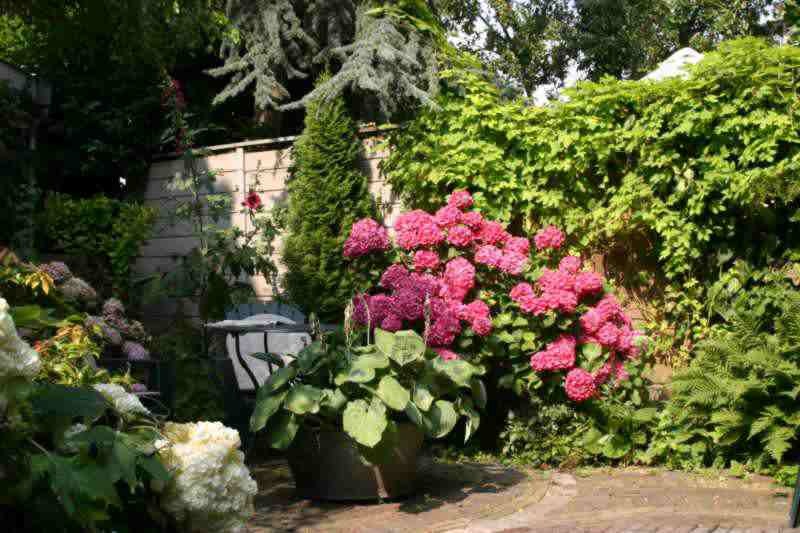 I simulated this situation with the two garden photographs shown below. The first photograph is normally exposed and the garden is seen normally. Then I widened the diaphragm of the camera without changing the exposure time. This is the same situation as happens when the pupils suddenly widen in a situation of unchanged ambient lighting. 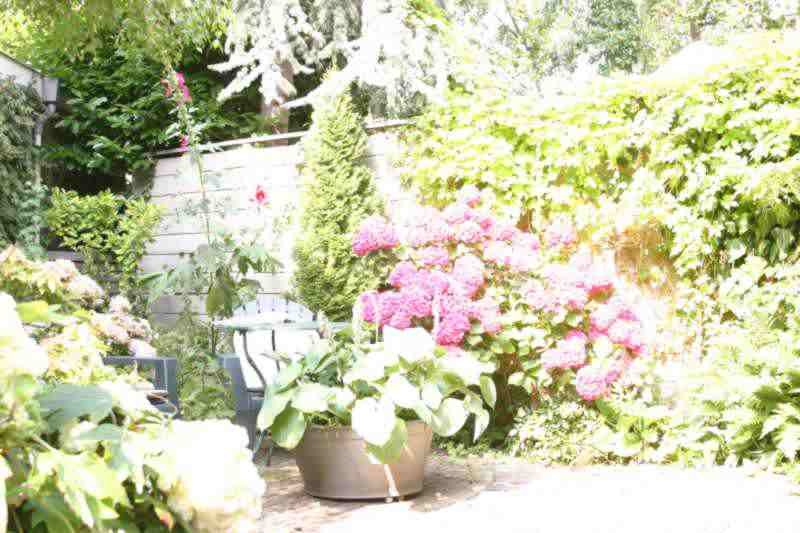 The result was that the garden appeared flooded with bright light, and some parts of the image were out of focus. This is a wonderful demonstration of the role of the pupils in generating the perception of "bright light". But why should the pupils of a person widen at a time when the pupils of other people in their vicinity do not widen? Pupils will widen as a result of serious oxygen deficiency, as a result of surprise or fear ("eyes like saucers"), as a result of increased sympathetic nervous system activity such as occurs during many severe illnesses, and as a result of drugs such as adrenaline. One or more of these things may occur in a dying person, or as a result of injuries, accidents, life-threatening events, and fear. Any one, or more of these factors is always present in someone who believes their lives to be threatened, to be near to death, or actually dying. I will give an example. In the article in the Skeptical Inquirer, I used the example of a report of the experiences of an unfortunate woman who during 1923 AD lay dying of heart failure after a difficult childbirth in the Mothers' Hospital in Clapton, London, England. 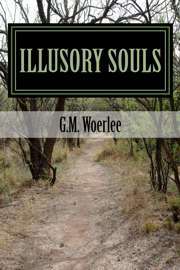 This report is published in the book by Sir William Barrett called "Death-Bed Visions. Psychical Experiences of the Dying" (1). It is a report which particularly appeals to me because it clearly illustrates the role of the pupils in the perception of "bright light". Furthermore, it also appeals to me because I once worked in this same hospital as an anesthesiology resident during 1978-1979. A photo of the hospital shows it as it was when I worked there, and it had not changed much since 1923 when the events in the report occurred (see photo below). 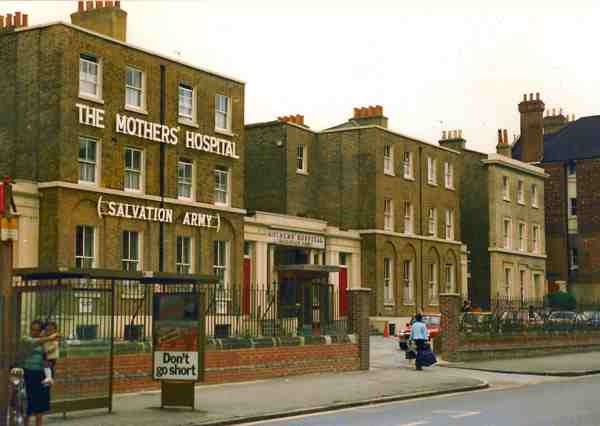 The Mothers' Hospital has since been demolished and replaced by a housing estate. But at the time I worked there, as well as during 1923, the district of Clapton was inhabited by the poor and socially deprived. And during 1923, it was not uncommon for young women to die during childbirth. Heart failure was a relatively common cause of death at that time, usually as a result of heart valve diseases caused by a disease called "rheumatic fever" which was common among poorer people in the earlier years of the twentieth century. The full report of this woman's passing reveals a touching affirmation of her religious beliefs, although the cause of her experience was rooted in her body function. Lady Florence Barrett was the wife of Sir William Barrett, and was also the obstetrician of this dying woman. She reported how the woman revivied after a short period of unconsciousness. Subsequently she had other visions among which a vision of a recently deceased sister. But then she turned to her husband, who had come in, and said, "You won't let the baby go to anyone who won't love him, will you?" Then she gently pushed him to one side, saying, "Let me see the lovely brightness." Her husband was leaning over her and speaking to her, when pushing him aside she said, "Oh, don't hide it; it's so beautiful." These last two passages reveal that the presence of her husband before her eyes blocked her vision of the "lovely brightness", something which could only happen if the brightness was due to light entering her eyes. No-one else reported seeing a lovely brightness in the room. So the only way this woman could see a lovely brightness due to light entering her eyes under these circumstances was due to widening of her pupils! Widening of the pupils is one cause of "seeing the light", or of being "engulfed by light". Yet while widening of the pupils is a cause of this experience, it does not explain light experiences undergone by those whose eyes are closed, or those people who are in the dark. These light experiences are due to other causes. activation of the visual cortex due to epilieptic attacks in susceptable people. All these effects can give rise to the visual experience of bright light, as well as the experience of passing through a tunnel to enter a region of bright light as was suggested by Dr. Susan Blackmore (5). So changes in eye and brain function can generate the sensations of light, of bright light, as well as sensations of passing through a tunnel to enter a region of light, or of passing through a tunnel of light. Even so, this still does not explain all experiences of light. The effects of severe disease, the mental effects of drugs, the mental effects of withdrawal of some drugs, and well as the effects of some mental states can all induce states of mind during which people hallucinate that they see light, experience light, or pass through a tunnel of light. It does not really matter that these people are hallucinating, because they really are experiencing light, seeing a bright light, or passing through a tunnel of light. Indeed, functional brain scanning of hallucinating people reveals that the brain areas concerned with vision are just as active in these people as if they were seeing things with their eyes (6,7). "Tunnel experiences", "The darkness", "Tunnel of light"
There are several ways people can experience an experience of darkness without the necessity of invoking a spiritual cause. It really is dark, either because the person is in a dark place, or because the lights were turned off. A person will perceive darkness in these situations. The eyes are closed, and so a person will perceive darkness. The retina fails due to oxygen starvation. Fainting is a good example of this. People faint because the flow of blood to the head suddenly stops for a few seconds. The effect of sudden cessation of blood flow to the head is sudden total oxygen starvation of all organs within the head. Of all these organs and tissues, the tissue most sensitive to oxygen starvation is the retina of the eye. In fact the retina needs mores oxygen to function than does the brain or the brainstem. This means that people lose their vision before they lose consciousness due to fainting. And indeed, this is exactly what happens, because many people report that everything went dark, or black just before they lost consciousness due to fainting - and they must have been conscious in order to have consciously perceived such a sensation. More than 90% of all dying people ultimately lose consciousness and stop breathing due to oxygen starvation. This is why many of the dying say, "It's getting dark. Everything is black. etc." More than 90% of all deathbed experiences and other near death experiences are due to oxygen starvation, which is why many people undergoing and reporting such experiences often tell of a period of darkness. The cause of the ultimate loss of consciousness of death is oxygen starvation in more than 90% of all dying persons. Such oxygen starvation is usually not sudden, as occurs during fainting, or cessation of heartbeat. Instead it is usually more gradual in onset, and this is where the distribution of blood flow in the retina determines what people see during these periods. It is worth while first looking at the basic anatomy and function of the human eye. Light enters the eye through the cornea (c). Light passes through the pupil and through the lens (le). The lens focusses the light onto the retina (ret), the licht sensitive membrane at the back of the eye. The retina is a light-sensitive membrane which converts the images of light focussed on the retina into nerve signals which are conducted to the brain along the optic nerve (on). Now we come to the retina itself. 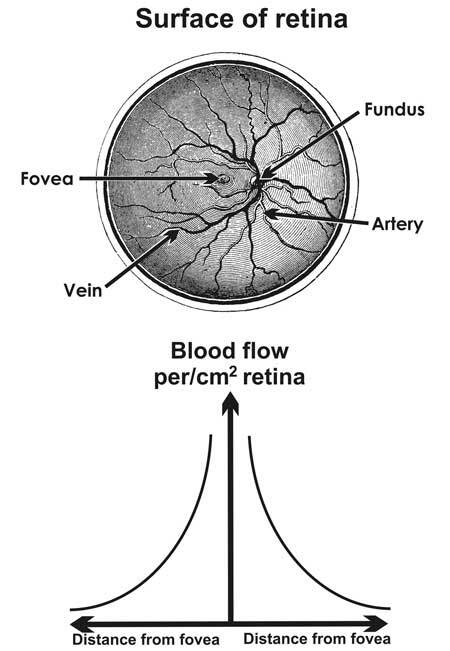 Not only does the retina consume more oxygen than the brainstem, which is why people suffering from oxygen starvation always see darkness before losing consciousness, but the distribution of the flow of blood to the retina means the retina has a structure making it uniquely suited to generating tunnel experiences. The figure shows the retina as seen when looking through the cornea into the back of the eye. The retina is fed with oxygen and nutrients from blood vessels radiating out from the "fovea", which is also the point where the optic nerve enters the eye (see drawing of eye above). The retina is made up of nerve tissue consuming enormous amounts of oxygen, and this oxygen is supplied to the retina as oxygen chemically bound to to the hemoglobin in the blood flowing through the arteries. The aerties radiate out in a circular pattern, forming a circle, which means that the supply of blood and oxygen to each square millimeter of the retina decreases with distance from the fovea according to the graph, i.e. flow decreases according to the formula 1/(square of the radius) = inverse square law. This relationship for blood supply to the retina has been demonstrated many times. Because the oxygen consumption to the retina is more or less similar all over the retina, this means that reducing the supply of oxygen to the retina by any one of the myriad causes of oxygen starvation will cause failure of the outer (peripheral) parts of the retina before causing the cental retina to fail. The result of this is that the affected person will only see a central spot of light surrounded by darkness - "tunnel vision". The figure below shows how this happens in an oxygen starved retina. 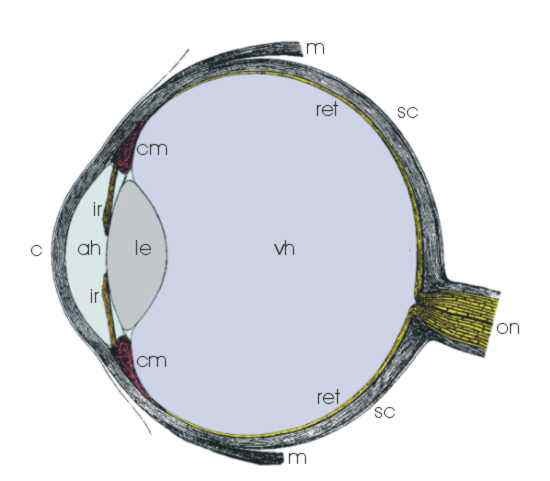 Diagram-A shows the flow of blood from the fovea to the periphery of the retina, and the grey coloration indicates that the degree of oxygen starvation increases with distance from the fovea. Diagram-B shows the situation of looking at a man through such an oxygen starved eye. 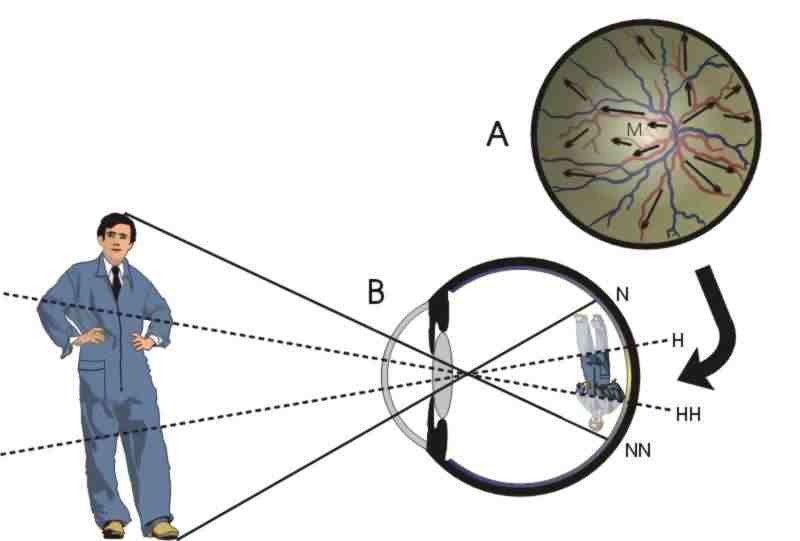 In the normally functioning eye, the image of the man is projected upon the retina from N to NN, and the person can see the figure of the whole man. But when a sufficient degree of oxygen starvation causes failure of the peripheral retina, a situation arises where the areas of the retina from N to H, and from HH to NN no longer function. This means that nerve signals generated by the retina in response to the image of this man only arise from the still functioning area of retina H to HH. The effect is that the image of his upper and lower body disappear - it is like looking at the man through a tube, or a tunnel. And because only the region of retina from H to HH functions, the partial image of the man is seen to be surrounded by darkness. This is how the oygen starved retina generates the perception of looking through a tunnel. 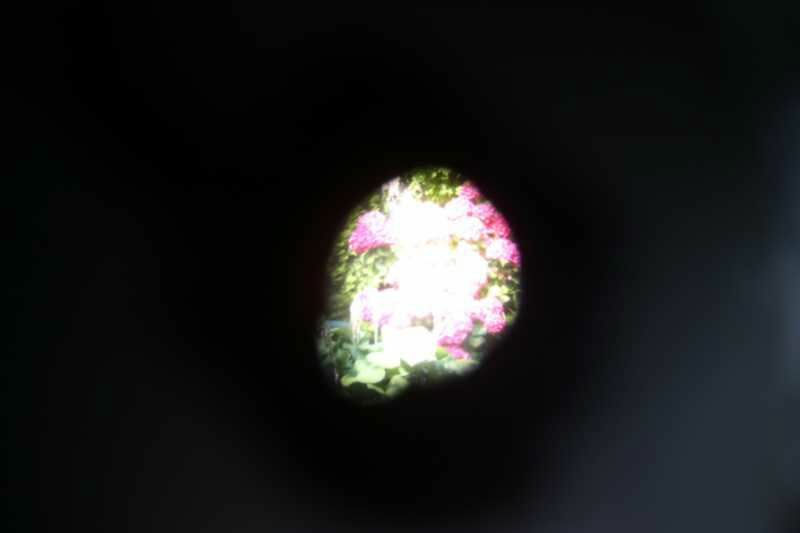 I made some photgraphs in a garden to demonstrate the effects of tunnel vision in the oxygen starved eye. 2 -Pupils widen due to oxygen starvation, fear, medicines, etc. More light enters the eyes, so that the light that is seen is perceived as bright. 3 -The outer edges of the retina fail, causing tunnel vision, and "bright light" pours in through the "tunnel" to form a "tunnel of light"
This is how the functioning of the eyes generates the sensations of "darkness", of "tunnels", of "bright light pouring into the tunnel", and of a "tunnel of light" in people with opened eyes during oxygen starvation. Resuscitaion restores normal retina function, restoring normal sight, so generating the perception of "leaving the tunnel to enter the light" in people who still have widened pupils when their retina function is restored. Even so, some people do undergo tunnel and light experiences while in darkness, or while their eyes are definitely closed. Sometimes people undergo "tunnel experiences", or experience a "tunnel of light" when their eyes are closed, or while they are in darkness. There are two possible mechanisms by which the body can generate such sensations. Malfunction of the optical cortex. Dr. Blackmore and her colleagues found that when the optical, or visual cortex of the brain is increasingly stimulated, as can occur during epileptic nervous activity such as due to oxygen starvation, the effects of drugs and medicines, or migraine, a truly wonderful sensation of moving through a tunnel to "enter the light" sensation can arise, or to experience a "tunnel of light". Hallucination. The hallucination of moving through a tunnel to enter light, or a "tunnel of light", can be generated by the functioning of other bodily mechanisms such as those generating out-of-body experiences, combined with the expectation of entering a brightly lit heaven, paradise, or life after death. After all, for many people, deathbed and near death experiences are determined to a large degree by their expectations and socio-cultural upbringing (see Near Death Experience-Types). The fact that these experiences are hallucinations does not in any way diminish their reality and impact upon those undergoing them. These are several of the mechanisms by which the body can generat sensations of "darkness", of "tunnels", of "light pouring into the tunnel", or of a "tunnel of light". No supernatural explanations are required. Even so, some people say these explanations are all very well, but they do not explain the serenity and wondrous ineffability experienced by those reporting these sensations. Accordingly they then proceed to say that these explanations do not explain these sensations of light, of darkness, and of tunnels, because they do not explain the personal perceptions and associated emotions. Unfortunately these people make no disctinction between a perception and an associated emotion. Look at the situations of people undergoing deathbed, or near death experiences. These people are near to death, or actually dying, and this means their brains are also influenced by the causes of their dying, or their near death experiences. After all, if they were not dying, or near to death, they would not undergo these experiences. All causes of death affect brain function, resulting in typical manifestations of abnormal brain function expressed as perceptions and emotions. The abnormal brain function of these people causes them to feel calm, serene, ineffable, even joyous, while removing the sensations of pain and discomfort. They even feel their mental function is normal, or even better than normal. Yet an observer sees something quite different - observers see a sick, dying, or apparently unconscious person with abnormal brain and body function. This is the cause of the differences between the perceptions of experiences undergone by healthy persons, and the perceptions reported by dying persons of the same experiences. So when the eyes or the brain of a dying person generate tunnel and light experiences, it is not at all surprising that they also report associated sensations and emotions of serenity, ineffiability, etc, etc. So the body is capable of generating all the emotions, sensations, and the perceptions of "the light", of "darkness", of "tunnels", of "passing through a tunnel to enter light", and of a "tunnel of light". No unknown immaterial forces or powers need to be invoked to explain these sensations and perceptions. Rupin E, Reggia JA, (2001), Cortical spreading depression and the pathogenesis of brain disorders: a computational and neural network based investigation.Neurological Research, 28: 447-456. Hadjikhani N, et al (2000), Mechanisms of migraine aura revealed by functional MRI in human visual cortex.PNAS, 98: 4687-4692. Gastaut H, et al, (1961), Chapter 32. Hypoxic activation of the EEG by nitrogen inhalation. 1. Preliminary investigations in generalized epilepsy. pages 343-354, in the bookCerebral Anoxia and the Electroencephalogram, edited by H. Gastaut and J.S. Meyer, 1961, published by Charles C. Thomas, USA, 1961. 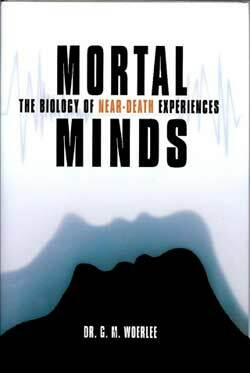 Blackmore S, (1991), Near-Death Experiences: In or out of the body.Skeptical Inquirer, 16: 34-45. Silbersweig DA, et al, (1995), A functional neuroanatomy of hallucinations in schizophrenia.Nature, 378: 176-179. Ffytche DH, et al, (1998), The anatomy of conscious vision: an fMRI study of visual hallucinations.Nat. Neurosci., Dec;1(8):738-42.